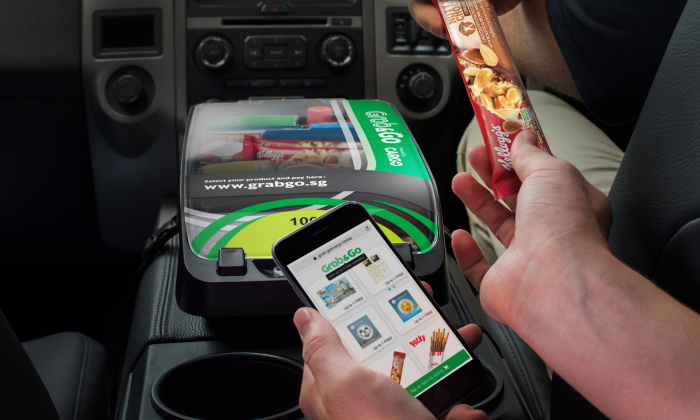 Grab has stamped a deal with Cargo, in-car goods and services provider, to introduce a new passenger experience, Grab&Go in Singapore, also marking Cargo’s first international expansion. Through this partnership, passengers will be able to choose from a mix of complimentary samples and premium retail products when riding with Grab&Go-equipped vehicles. The partnership has already seen brands such as Kellog’s, Biore UV, Novu and Unilever’s Lux Luminique, coming on board to distribute the products its passengers. The move allows Grab driver-partners to earn additional income each time a passenger uses the new service, regardless of whether they made a purchase or took something for free. Additionally, the new experience will also allow for driver-partners to boost their ratings for each ride. According to Jeff Cripe, founder of Cargo, the brand had worked hard with Grab to create a viable expansion model. Following the Singapore Grab&Go launch, the two companies also plan to expand the offering to other Southeast Asian markets. “Through co-branded licensing deals with global rideshare leaders such as Grab, we will help drivers earn more, create a new distribution channel for brands, and develop the next generation of passenger experience worldwide,” Cripe added. “At Grab, we are always thinking about ways to better serve our customers. We’re excited to partner with Cargo to deliver more value to our passengers, while increasing the number of income streams available to our driver-partners. It’s a win-win for both drivers and passengers, and we are looking forward to bringing this experience to all our customers in Southeast Asia,” Nash Islam, head of regional advertising, Grab said. Most recently, Grab launched Grab Ventures, an innovation arm aimed at “discovering and growing Southeast Asia’s next generation of technology leaders”. This was in a bid to promote innovation and digitisation in the region. Following the move, Grab Ventures will work with private sector firms and government agencies in Singapore and across the region to support growth-stage technology companies. This is by helping them develop and scale technologies that will solve transportation, logistics, food and payments challenges in Southeast Asia. Grab Ventures will also launch “Velocity”, an accelerator programme for growth-stage startups looking to expand across Southeast Asia. It seeks to partner eight to 10 growth-stage startups over the next 24 months and may invest in select startups that exhibit strong synergies with Grab. It will focus on partnering startups operating in sectors such as transport, food, logistics and financial services. The Grab Ventures portfolio currently includes GrabCycle, a marketplace for multiple personal mobility partners; Kudo, Indonesia online-to-offline (O2O) platform; Drive.ai, AI solutions for autonomous vehicles; and iKaaz, an emerging markets mobile payments platform. “As Grab turns 6, we are experiencing a period of solid growth. Grab is ramping up innovation in-house to scale faster as the leading O2O mobile platform in Southeast Asia. We’re always open to partnerships where it makes sense for our business, and will look to partner or invest in the right company that enables Grab to expand our business quickly, explore new technologies and build new capabilities,” Anthony Tan, group CEO and co-Founder, Grab, said. He was most recently regional director of strategy, digital and media at Hakuhodo Communications Asia. ..
"Upon further reflection, it’s clear that the broken system is ad-driven media on the internet," said Medium's CEO and Twitter's c..